The second day of the Star Trek con featured a whole bunch of Star Trek: Deep Space Nine regulars and guest stars including Armin Shimerman, Nana Visitor, Rene Auberjonois, and Chase Masterson. Also on hand were Voyager’s Tim Russ, TNG’s Jonathan Frakes and the original Star Trek’s Walter Koenig. See below for full report and photos. Friday kicked off with a big Deep Space Nine Aliens panel featuring Jeffrey Combs (Weyoun and Brunt), Nicole de Boer (Dax), Vaughn Armstrong (DS9: Danar, Seskal), Casey Biggs (Damar), Max Grodenchik (Rom), Armin Shimerman (Quark), and Chase Masterson (Leeta). Creation’s Adam Malin moderated, noting how the different aliens represented different aspects of the human condition, like Shakespeare characters. Combs agreed and noted that he never played his many Trek characters as bad guys, just people with different agendas. 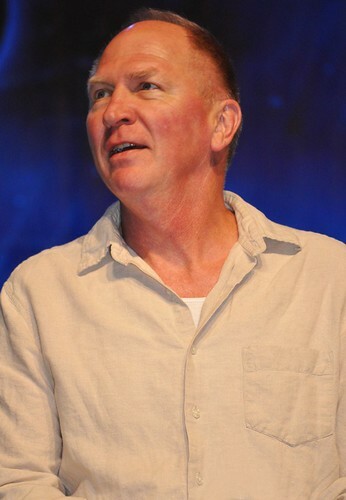 Armstrong talked about how he has played a record 12 different Trek characters, including 2 on DS9, noting that the writers like his drunken interactions with Quark and wrote more parts for him. Armin and Max talked about how they both auditioned for the role of Quark and in the end they knew they were the final two choices as they were the only short actors left. They and Masterson also talked about how they were happy to move the Ferengi away from the one-dimensional opportunistic version portrayed on TNG. Masterson also noted how she appreciated the writers making Leeta and Rom a "happy couple" while still being interesting. Biggs said he was happy with his arc over the years with Damar, including how eventually the Cardassians became the good guys like the Klingons before. He enjoyed exploring Damar’s descent into heavy drinking, but was glad for the last time he had to drink Kanar which was actually Karo syrup. When discussing how she dealt with taking on the role of Ezri Dax for the final season, Nicole said tried to make it her own but also would clasp her hands behind her back when walking, as a tribute to Terry Ferrell’s portrayal of Jadzia Dax. TrekMovie has already reported on one aspect of Koenig’s appearance at the con, but that is not all the actor had to say. The first question for Koenig complimented him on his Russian accent, which surprised him. He noted that over the years he had got a lot of criticism for it and said he had a "special hate" for Internet bloggers and commenters who critiqued it. Koenig also thanked all the fans who lobbied to get his recently awarded star on the Hollywood Walk of Fame. 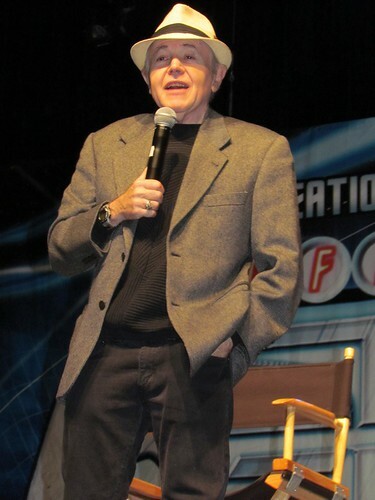 Regarding his appearance in Star Trek: Generations, Koenig said that he originally turned down the role because there was nothing special about it for his character. The actor said his original refusal surprised producer Rick Berman, who agreed to give him a reaction scene to Kirk’s death, but it was cut. Walter also entertained the Vegas crowd with stories of appearances with James Doohan and George Takei at store openings and the like, including once in uniform where he was mistaken for a bellman at his hotel. 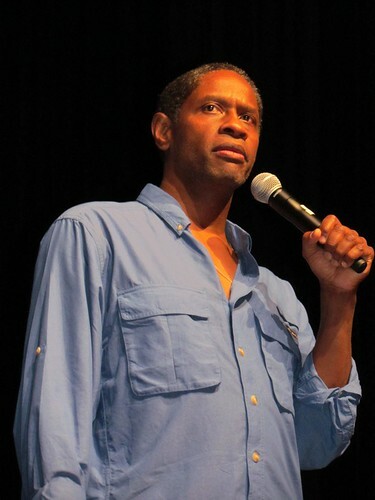 Star Trek: Voyager’s Tim Russ hit the Las Vegas stage by singing a Star Trek version of the Love Boat theme. Talking about working on Voyager, Russ commented that Kate Mulgrew (Capt. Janeway) was very much the captain of the cast, and that she never flubbed her lines, including the technobabble. Talking about a future with Star Trek, Russ said that there have been three different people who have pitched ideas to him for new Trek series, none of which have been pitched to CBS. He also said that he would consider directing an independent Trek film again, like he did with Star Trek: Of Gods and Men. The actor says he keeps busy with voice acting and he does not expect to return to play the principal on iCarly because the show has moved away from the school. 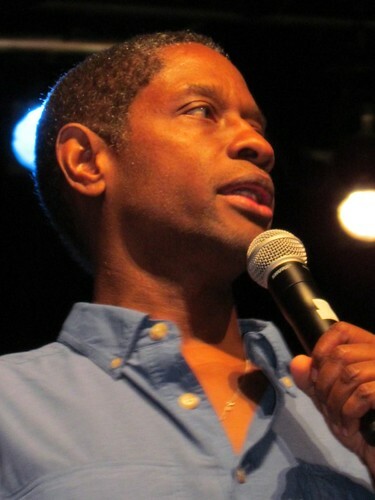 He also noted that these days he is more recognized for his work on iCarly than Tuvok on Voyager. 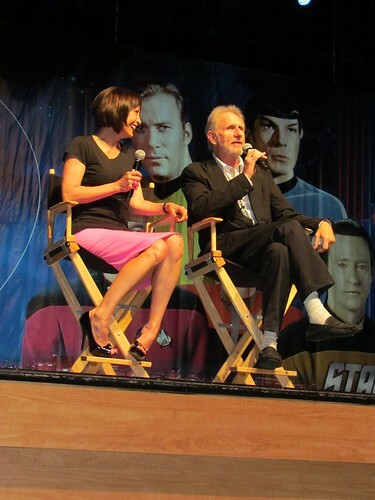 Star Trek: Deep Space Nine stars Nana Visitor and Rene Auberjonois appeared together at Las Vegas, showing that same chemistry the head on screen. The pair started off talking about recent projects, with Visitor noting she had recently finished shooting for Torchwood Miracle Day with John de Lancie (TNG: Q). Rene says that his time is mostly taken up with voice work, doing 5 different cartoon voices in the last week. Auberjonois also says that he expects to be returning to Warehouse 13. The pair reminisced about some DS9 episodes, with Nana revealing that she needed a special baseball coach to help her in "Take Me Out to the Holosquite," because she didn’t know how to hit the ball. The actress also said that Ira Steven Behr was her favorite writer because he was the one who always wanted to do Kira focused stories. As for the finale of DS9, Visitor said she cried for two weeks leading up to the final shoot. For his part Auberjonois noted that he wasn’t too keen about his final scene being in a tuxedo, and he wished Odo went into the Great Link wearing his traditional Bajoran uniform. But they both agreed that returning to his people (and leaving Kira) was the right thing to do. Both also revealed they took home souvenirs from the set, with Rene taking home his bucket, joking "you need to have a wastebasket." Jonathan Frakes, Star Trek TNG’s Riker, opened up his set singing Volare, and continued the light-hearted tone throughout, such as calling Star Trek: Generations "Two captains in search of a good hair piece." Much of Frakes’ time was spent ribbing fellow actor Brent Spiner (who was appearing the next day). Frakes also ribbed Creation for the big stage backdrop which included a picture of Spiner, but not himself. Frakes showed he is a man of the people by hopping off the stage and he even roamed the crowd taking questions. Jonathan also talked about a few Next Generation episodes. He said "the one with Minuet" (“11001001”) was his favorite. 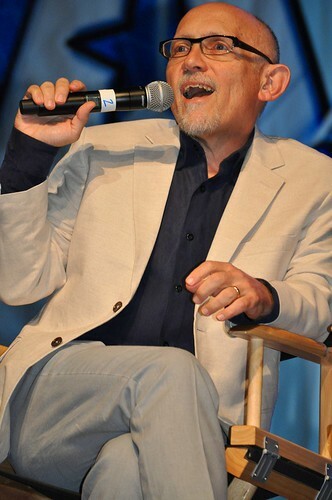 He also noted that most of his trombone playing on TNG was done by a professional musician. 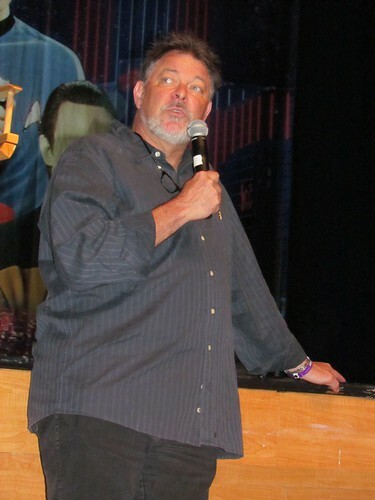 As for bad TNG, Frakes described the first season episode "Code of Honor" as a "racist piece of S#@*." The actor also revealed that his trademark beard began as a result of something he grew during a writers strike, which Gene Roddenberry decided he should keep once the show returned. At one point a fan asked Frakes about the story reported on TrekMovie.com about a comment he made to UGO about pitching a Star Trek series to CBS. Frakes seemed to not remember the article so I went up to the mic to note that TrekMovie later reported an update that the pitch never happened. Frakes agreed noting "I was approached to pitch to CBS, but told ‘don’t bother, Shatner has been turned down and Bryan Singer has been turned down." 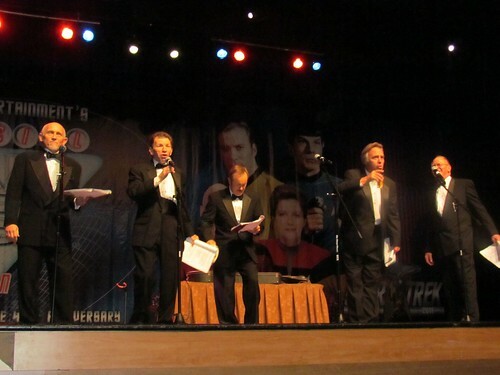 The day wrapped up with a "Rat Pack" performance with Max Grodenchik, Vaughn Armstrong, Jeffrey Combs, Casey Biggs and Armin Shimerman. TrekMovie will also have more daily wrap-ups, news, photos, videos and live reporting to stay tuned. Sorry for the delay, but technical issues got in the way. Looks like everyone is having a blast! Again, soooooooooo jealous of those who went. It looked absolutely amazing! I’ve seen some of Mr. Frakes interaction at conventions on youtube and he always seems hilarious! Would love to see him in person. Sounds like CBS isn’t interested in doing a new Trek series. Would love to go to one some year, looks so much fun!! ….why did Jonathan Frakes say “code of honour” was racist? Anthony: How did the “Star Trek Rat Pack” sound? The Rat Pack was really good. Casey Biggs was the best singer of the bunch. Max wrote the songs and they were funny. Good stuff. I loved the Rat Pack performance. I was there for the whole con and had a marvelous time. Ever watched “Code of Honor”? The racism is pretty obvious. It’s not “Birth of a Nation” bad, but bad enough. In Boston, I had the honor of sitting next to Vaughn Armstrong, Ethan Phillips and Jeffery Combs during a small cocktail party (Also sat next to the Duras sisters, Gwynyth Walsh was really cool) and I gotta say, Vaughn is a pretty awesome guy. When I lost my copy of the Enterprise Blues Band CD autographed by him and Casey Biggs, I went up to him and told him my situation, and he gave me a replacement for free! Also saw the Rat Pack concert in Boston, which was fun and awesome as well. I wish I could of gone to the Vegas Con. Poor actors, having to tell the absolute stories and jokes over and over and over and over to the exact same audience 10 times a year. I guess they probably consider it like reciting lines to a play. They are performing sanctioned lines. This is why you really don’t hear anything at all personal about them, their life, their family or *real* stories that went on during the show’s run. And I respect and understand this, but these attendees in the crowd sure pay a heavy ticket price to hear the same fart jokes and retreads of filming anecdotes on an annual basis. Ignore the negatives. I’m sure it was great. Last year it was terrific and have no reason to believe it was different just now. Yeah, they weren’t too interested in 1965 either. 11. Swing and a miss. Terribly cynical view of life. 6. They sounded “fun!” I was there and was really looking forward to their performance, having never seen it before, and they had a blast and it was a blast for the audience. (Some guys sang better than others, some missed their marks more than others, but no one in the room took it to serious, so it was fun to see them embracing the audience and their sly winks to Trek in their clever lyrics.) Great time had by all!!! Gawd Nana Visitor is such a babe lol For real! Oh, and lol@the guy next to Frakes XD Ah the diversity of Star Trek fans. Gotta love it. Frakes may be getting a bit up there in weight, but he’s Number One, so it’s okay. He could lose it if he wanted. 16. Is that diversity, or is it the norm in North America these days? Chase, Nana, and Nicole still looking awesome!! I think that’s great! Weight is an illusion. It’s all a matter of perspective. Sure, Frakes looks porky in the first photo, because he’s by himself. 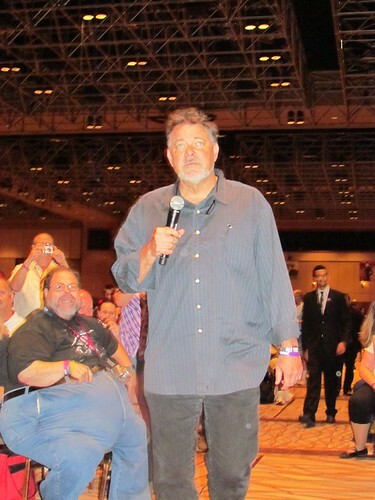 But if you take a look at the next photo right below it, Frakes looks relatively anorexic. @19 you’re right he looks positively famished in that next photo for some reason, must be a good angle? I think it’s because of the guy wearing the jeans sitting behind/to the right of him. #10 – I got the chance to spend some time with Vaughn Armstrong when I went to what I believe was my next-to-last convention in Indy. It was a Slanted Fedora con… and probably the most interesting con I had been to in years. It was held over Thanksgiving Weekend, so after work on Friday, I came to the con. Since my work is as a hospital chaplain, I was in my clerical collar and such. The guy running the con thought I was there ‘in costume’ as Jack Donner, who played a priest in, I believe, “The Exorcist”. I had to insist several times that I, in fact, wasn’t. He talked to me in the hall after the welcome session and after showing him a copy of my credentials, he asked if I would be interested in offering a worship service on Sunday morning. I said sure. Fast forward to Sunday morning… I arrived at 8:00 AM to set up for an 9 AM Communion. We had a pretty good turnout, I think about 25 people came and gathered in one of the hotel’s atriums. I can say it was the first and only time I have ever administered the Eucharist to Klingons, Romulans, Vulcans, Bajorans, or a/the Borg. We ended about 9:35, and some of the actors were out doing autographs in the main hallway. I spent some time with Gary Lockwood and then moved on to Vaughn Armstrong. My conversation with Lockwood was interesting, though not in a “G” or “PG” rated way… but the conversation with Armstrong was great. He was very friendly, and even though I am not the biggest autograph nut, his personability made me really want to get his autograph. Talking with him reminded me of my first ever Star Trek convention when I got to sit with George Takei at the autograph table for nearly a 1/2 hour talking about all kinds of things – mostly non-Trek. I do miss cons… Indy gets one a year these days, and they are kinda difficult for me to go to given my Sunday responsibilities. Over the years I have had some really neat experiences at them, including being ‘berated’ by William Shatner after a costume/talent contest. Apparently he had arrived and was backstage during the contest, where I, dressed as Kirk from Generations, essentially managed to off myself. I won the contest, together with about $50.00 in dealers room credit, and went back to my seat. A few minutes later, they announce Shatner, and he comes out on stage. “It’s good to be here in Indy with all of you, but to that little pip-squeak who just won the costume contest, I DON’T TALK LIKE THAT!” (Of course, imagine all that being said in Shatner-ese. He started to laugh, the crowd roared, and the con went on. I saw Nana Visitor during the same con I referenced in my previous message. I didn’t buy autograph tickets, and she was only there for one day, so no chance for a run-in outside the con… but her presentation and joviality was the real highlight of the sessions that weekend. Her laugh is infectious! This year, Starbase Indy has moved off of Thanksgiving weekend. I’ll have a 6 week old, so I don’t think I can really go… but I might try, if they have a decent guest or two. The fat guy sitting behind Jonathan Frakes looks like Jabba The Hutt while Frakes looks like a deer caught in the headlights! A lot of my favorites here, pretty stellar. And man, Trek is populated with some lovely women. Like the fat guy behind him? Why is it that when actors get older they let themselves get out of shape? Shatner is a prime example. Now Frakes. Chase Masterson, Nana Visitor and Nicole deBoer. Yowsa. Oh My! Yipee! Man, I miss DS9. I would love to have a drink in Quark’s. I’m very happy that Trek conventions continue; just went to one in Boston and had a great time. But I have noticed a serious lack of attention being given to the “new” Trek. I did not see one poster or clip or discussion about the new crew or the concepts or ANYTHING. A mention of it would have been nice! C’mon peeps, this IS the future of the franchise, lets not let it wither waiting for the next movie! Or, wake up those morons making this new movie crap and get us back in the prime universe on the small screen where it belongs. The only reason any of the movies were successful was because of the tv series that came before them. Any kind of reunion for ds9/tng, maybe voyager – even as a one off would make them a good amount of money. Maybe not as much as a reboot film would, but surely there is room for both? The Frakes gimmick poster at the AVClub is one of the funniest things on the internet. Unless it’s actually him, in which case it’s much, much funnier.